no minimum order when picking up on Wed and Fri.
Dinner without the fuss. Let us take care of that for you. Juicy breasts, thighs, drums, and wings seasoned with our secret herb seasoning. Sliced roasted beef tossed in au jus. Penne pasta and delicious hand rolled meatballs in a simmered homemade sauce. Tender cabbage stuffed with a special blend of ground meat and rice baked in a delicious semi-sweet tomato broth. 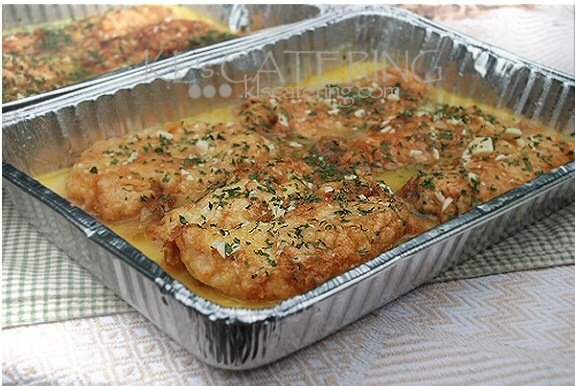 Lightly breaded tender chicken strips served in a rich simmered chicken sauce. Pasta Shells stuffed with a blend of ground meat, spinach, and seasonings baked in a rich simmered sauce topped with imported cheeses. Pasta Shells stuffed with a rich blend of ricotta and cheeses baked in a simmered sauce topped with imported cheeses. Sliced ham topped with a sweet pineapple glaze and maraschino cherries. Chicken strips coated with a light egg batter sautéed in a light lemon butter wine sauce. A brief description of the dish. Tender fresh roasted pork sliced and drizzled with garlic and pork au jus or topped with apple chutney. Chicken breast, thighs, drums, and wings seasoned with our secret blended breading and deep fried the southern way. Chicken breast, thighs, drums, and wings seasoned with blended spices and basted with sauce.